Home > VoIP Support FAQ > Domain Names > How do I set up Email Forwarding for my domain? How do I set up Email Forwarding for my domain? Email Forwarding is an easy way for emails sent to a mailbox associated with the domain (e.g. User@mydomain.com) to be forwarded onto another email address. 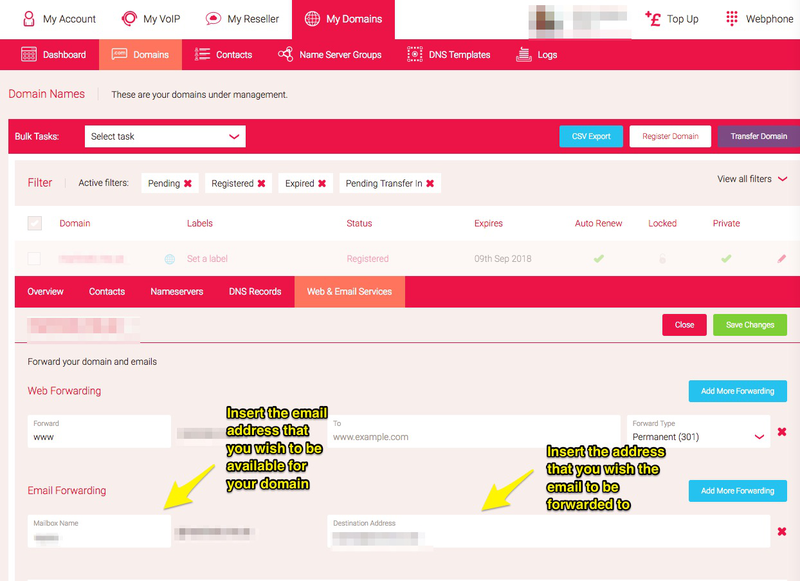 To navigate to this area from your Dashboard, simply go to My Domains, and then click the pencil icon corresponding with your chosen domain under ‘Domains’. You can then select Web and Email Services from the tabs that appear below, and click Add Forward beside Email Forwarding. Enter the Mailbox Name, and the Destination Address (where you would like us to forward the emails to) and click Save Changes to create the Email Forward. You can also set up multiple Email Forwards, going to different email addresses if necessary, by clicking Add More Forwarding. Note that you will not be able to send out emails from the Email Forward address that you set up on your domain.